Do you have the right words? Great sayings for a wedding day can make their way into the festivities in a variety of ways. Even if you aren't a natural wordsmith, you can still write or find the perfect saying for a wedding. Wedding Card: Purchase a wedding card with a wedding card verse that has a great quotation or saying in it. Alternatively, choose a blank card so you can write your own wedding saying inside. Speeches: A great saying starts and finishes a speech nicely, whether it is at an engagement party or the wedding reception. The best man and maid of honor speeches are traditional, so prepare with an appropriate saying. Recorded Greeting: During wedding receptions, the videographer often asks guests to express their wedding best wishes to the couple. Having a great saying ready is perfect for people who aren't good with on-the-spot requests. It is also appropriate to use a saying in an engagement or bridal shower card. When used in a bridal shower card, the saying is usually geared more towards the bride than the groom, although including both spouses in your thoughts is a nice gesture. Relevance: Couples are not all the same. If you are close to the couple, try to choose a saying that fits their relationship and current life situation. Wisdom: A great saying usually imparts some bit of wisdom to the couple. Pick a saying that offers insight into marriage. Sometimes it is a thought passed down through the ages on love, while other times is it a humorous quip about married life that has a wise undertone. Flow: The flow of the saying is almost as important of what is being said. If the saying's meaning is smart and funny, but written in a choppy manner, the point is lost. Choose a saying that sounds lyrical or is written in a verse for the best flow. A great saying that is spoken aloud often differs from words of wisdom for a wedding card. Long verses with unfamiliar vocabulary are more difficult to impart when spoken, and make a better choice for what to write in a wedding card. Giving a toast or speech with a wedding saying sounds good when it rhymes, which may read a bit cheesy when written in a card. Love Poems: Poetry offers beautifully written words on love and romance. Instead of writing out the entire poem, just use an excerpt with the important stanzas. Quotation Books: Famous people often write about marriage and love, so a book of quotations usually has a chapter on love and/or marriage. Religious Texts: Seek out a quotation from a religious book or text that offers insight into love. Be sure to choose the religion that the couple follows for the most impact. Internet: The internet offers plenty of great sayings-simply do a quick search on wedding sayings to find a number of sites at your fingertips. People with a natural gift of writing may want to compose their own great wedding wishes in a saying. If you want to attempt this, start several weeks before the wedding so you have time to revise the saying. Keep the couple in mind and write whatever comes to mind, then edit later. Out of a brainstorm session, you usually find a few great sayings to pass on to the newlyweds. 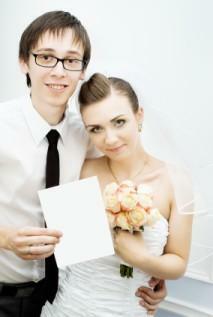 A wedding saying is a wonderful way to send congratulations to the couple, whether spoken or written.